Trips down the Salmon River average 2.5 hours on the water. From Buffalo or Rochester - Take Route 90 East to exit 36 (Route 81 North). Take Route 81 North to exit 36, which is the Pulaski exit. Turn right onto Route 13. Go about 5.5 miles and watch for the "Brown’s Family Campground" sign. Turn left into their driveway. Call for departure times. Cost is $50.00 per person. Reservations are mandatory. Our Site Office is located at Brown’s Family Campground in Altmar, N.Y. There is ample parking, well-lit changing areas, and clean restrooms. Best of all, we have the whole place to ourselves. 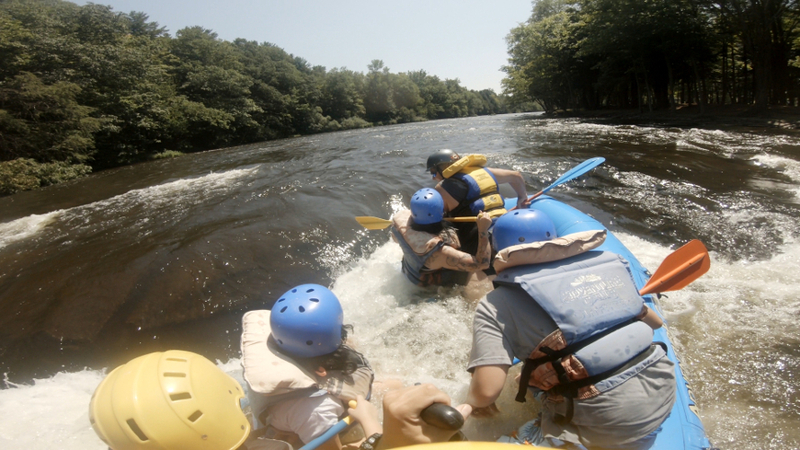 Another advantage of rafting with us is, you’ll spend more time on the river than you did driving to and from Pulaski. Following arrival and getting checked-in, it’s just a short bus ride to the launch site. After you've had a Safety Talk and the Trip Leader checks everyone’s gear, get ready to raft on some of the cleanest water in the Northeast. After launching at the Route 2A Bridge, you’ll have a little time to get accustomed to using the paddle skills you just learned in the fast current before our first play stop at “Sylvia’s Hole” rapids. Any paddle crew that wishes to will have the opportunity to maneuver their raft upstream back into the rapids and “surf” them. As the river flows through the village of Pulaski, rapids like; "Firemen's Field," "Washing Machine," “Luisitania”, "Titanic" and "The Black Hole" follow almost one after the other to really get your adrenaline flowing! Along the way we’ll stop and anyone wishing to test his / her mettle will be led a short distance upstream along the river’s edge and then allowed to body-surf a set of rapids back to the rafts. Upon reaching the takeout it’s just a brief carrying of the raft up the embankment to the paved laneway where you’ll bid adieu to your sturdy craft and climb aboard one of our buses to be transported back to “Brown’s”.